The State conditions tab allows you to configure rules for a monitor to switch to/from a Down State and a Warning State. A state conditions framework overview can be found here. You can add or remove any available state condition sections, inherit a state condition from the parent tree node, or turn section inheritance off and, hence, define a custom state condition. 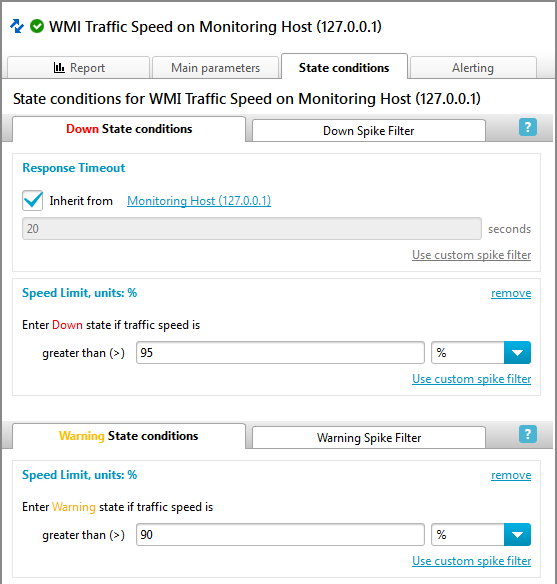 A new Down State Condition is added to the sample Traffic Speed monitor below, but not saved yet. 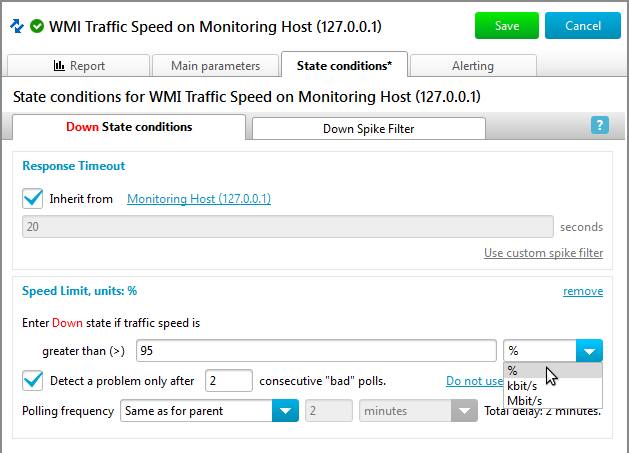 The monitor will switch to a Down state if the traffic speed is greater than 95% of the bandwidth for two consecutive polls (Because of spike filtering. You can read more about spike filtering below). After the changes are complete, click Save button at the right-hand top corner of the Parameters/Results Pane. You can also press Ctrl+S to save your changes and Esc to cancel saving. You can’t modify an inherited condition directly. 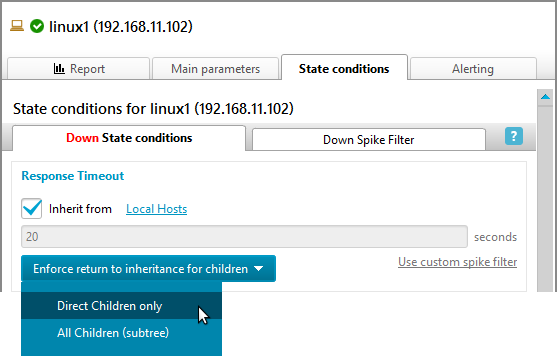 Either you need to uncheck the Inherit from checkbox to make the condition monitor-specific and edit it, or open the parent State condition tab clicking the link to the right of the inheritance checkbox. Note that all the changes in a parent’s state conditions will apply to all its children that inherit these conditions. If you add a section to the parent while some child nodes use custom state condition sections of the same kind, a confirmation dialog will be shown where you can choose whether to override the child’s section or to keep it customized. You can add/edit/remove any state condition section on any Main view node (except for monitors) because such sections are used for inheritance and it is not yet known what types of monitors will inherit them. On the monitor tab you can only add/edit/remove state conditions sections defined for a given monitor type. The host tab below contains only one already defined state condition section for the Down state (host-specific, note that the Inherit from checkbox is unchecked), and one inherited Warning state condition. The host configuration allows you to add any possible state condition section. If you add a new section to any tree node’s State conditions tab (except for the All Hosts root tree node), the section is initially inherited from a parent node if such a section is defined for the parent. 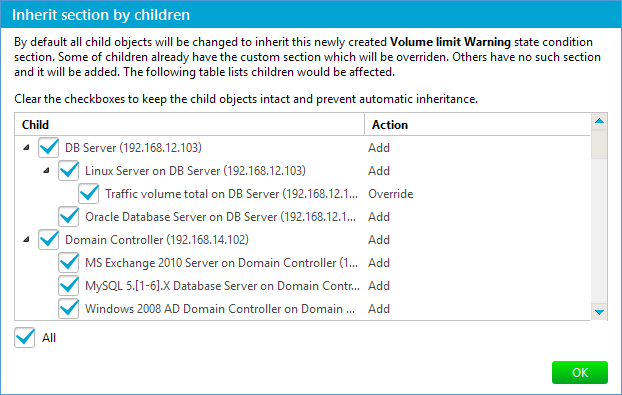 You can either save the inherited section, or turn the inheritance off and modify the custom section. If the parent does not have a section of the required type, then a new empty section is added. 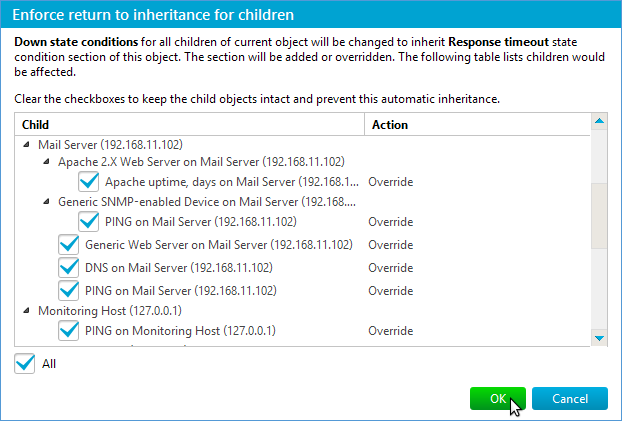 The Enforce return to inheritance for children button appears for any tree nodes other than monitors. It allows you to replace custom state condition sections for the children of a current node (e.g. 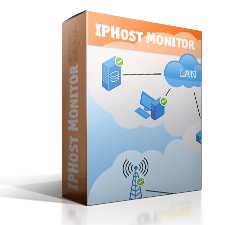 for all monitors on a given host) with the current parent section. The change will be propagated either to the direct children of the current node or to all the children, i.e, to all the subtrees of the current node. You can modify the list of children to be affected by the change. Click OK after setting the children list. Besides, this dialog can appear if a child already has the section that you have just added for the parent. You will be asked if the child’s custom section should be replaced with the newly added inherited one. By default the Spike filter is disabled. You can read more about spike filtering here.